Arizona and snowstorms don’t quite compute in my brain. But gliding through Oak Creek Canyon, between Flagstaff and Sedona, it’s definitely snow that I am wiping off my visor. Thick white flakes drape the entire windscreen on my BMW R1200RT, as our press ride charges through a brief blizzard. By all rights, I should be freezing, confirmed by the ambient air temperature reading on the Beemer’s dash. Instead I’m actually turning down the heated grips to an intermediate setting, because concealed behind the RT’s fairing and adjustable windscreen, I am as cozy as can be. The 2014 BMW R1200RT features a completely new engine, replete with electronic do-dads and fancy acronyms to match. Yet it is rider comfort, via ample wind protection and relaxed upright ergonomics that leave the biggest impression during my day-long press ride. The cold never bothered me at all during our 200-mile jaunt through Arizona’s high desert terrain, and I would have happily ridden hours longer on the RT through the snow or rain. So the new Beemer is really, really comfortable… not the sexiest kudos ever declared by a bike reviewer, but a not a bad start for a touring bike. BMW hails its new RT as the most versatile luxury touring bike in its lineup. The Riese-Tourer – that’s Travel-Tourer for us Amerikaners – splits the difference between the Bavarian marque’s F800GT Twin and K1600GT Inline Six. The latest generation Boxer Twin, which debuted on the 2013 R1200GS, has made its expected migration to the rest of the R family. The “precision-cooled” water Boxer, which routes liquid-cooling through the cylinder heads, delivers the identical power gains demonstrated on the GS, including a boost of 15 horsepower (a claimed 125 hp at 7750 rpm) and three lb-ft of torque (92 lb-ft at 6500 rpm). The RT profits from a more robust bottom and top-end, with Beemer engineers also ironing out the peaky mid-range. The RT’s Boxer differentiates from the GS engine with its two pounds-heavier crankshaft and larger alternator, which adds a further 1.3 pounds of rotating mass. The result is added flywheel effect, a trait exhibited on the new-for-2014 GS Adventure. Twist the grip and the new RT mill reveals its flat power curve, churning out a steady pulse of usable torque. The new Boxer has way more pull than we recall from the old air/oil-cooled RT, and a pleasing top end surge that wasn’t there before. The engine is more refined, with an even flow of power and minimal amount of vibration from the horizontally-opposed Twin. This Teutonic efficiency does come at the expense of some engine character. Curmudgeons will wax wistful about some of the quirks of the now-departed engine, which sounded more playful – maybe. But these critiques are based more out of rose-tinted sympathy for tradition than cold objectivism. Fueling and throttle feel from the ride-by-wire system are smooth and glitch-free. The three Ride Modes: Rain, Road and Dynamic, deliver the same hp/lb-ft output but with markedly different throttle response. I found Road the most amenable to sport-touring, with its potent but not-hyper-sensitive throttle. When traffic disappears and the backroad pace increased, the Dynamic mapping exhibits a more engaging engine response – sporty without being harsh. Rain mode features a more deliberate throttle feel – comforting while encountering wet roads during those snow flurries. The Ride Modes also alter settings on BMW’s Automatic Stability Control (ASC) system – with early intervention on Rain, a standard baseline setting on Road and less intrusive setup for Dynamic. In fact, BMW promises minor drifting of the rear wheel is allowed on the latter setting – a claim we did not test. The Beemer’s six-speed transmission features an optional Gear Shift Assistant Pro. This functions like a quickshifter, but also allows for clutch-less downshifts as well. Open the throttle and rider meets with seamless upshifts sans clutch. Off-throttle downshifts are also smooth, particularly in the middle gears. In practice, I found the application of the Shift Assist somewhat inconsistent – most notably on downshifts, where the fault was mine for not completely closing the throttle. The gear shift assist is a curious addition to the transmission package. I can see the allure to touring riders, as once up to speed the bike can shuffle gears without clutch pull. But the standard clutch operation delivers smoother engagement, and is required at low speeds anyway. It should be noted that the heavy flywheel effect and light clutch make for a forgiving launch, and the RT scoots along at low-speeds far defter than any 604-pound machine should. The RT also offers another novel feature for its touring clientele in the Hill Start Control system. Riders engage the system by squeezing the brakes on an incline, which activates the rear brake to hold so riders won’t have to hold the brake manually. The system disengages once the rider is up to speed again. I have to confess that I forgot about the Hill Start while riding… I benefited from it, I’m sure, but will have to reevaluate that functionality during a follow-up comparison review. Straddling the RT, I stand comfortably flat-footed with my 32-inch inseam. The frame and seat are slimmer than the predecessor, making reach to the ground easier, but the entire bike is 0.8 inches lower to the ground too. This lowering comes from the more compact Boxer layout. The entire riding triangle is lowered, and mimics the predecessor’s upright stance. The standard seat height (31.7/32.5 inch) can further be altered with the optional High (32.7/33.5 inch) and Low (29.9/30.7 inch) options. Because of the changes, the RT no longer requires a special “low suspension” variant for shorter riders. BMW’s proprietary Telelever/Duolever suspension units are employed on the RT. Our test bike also sourced the optional dynamic ESA with semi-active suspension. It offers three base settings: Soft, Normal and Hard. The suspension is further modified by the three preload settings: Single rider, Single rider plus luggage and a Two-up setting. The ESA settings default with the Ride Modes: Rain/Soft, Road/Normal and Dynamic/Hard. However, riders can adjust the suspension settings on the fly. The semi-active system adjusts compression and rebound, and monitors spring travel via sensors front and rear. Swapping between Soft/Normal/Hard brings a noticeable change to the bike. Soft is the preferable for low-intensity superslab work – sucking up rough chatter while floating along. Normal and Hard stiffen things up, with the latter firming up the RT into respectably sharp sport-riding trim. Leaving the RT in Soft setting while scything tight corners things can get a little loose, but used in the proper context the suspension settings deliver a composed, balanced ride. The RT’s Telelever front delivers improved feedback than from what I recall of its predecessor, or the old K1300 bikes. It still takes a little getting used to, but once riders gain confidence in the BMW setup, which doesn’t take long, the RT makes for an effortlessly stable mount. At speed the RT does not feel like 600-pound bike. The neutral-handling RT dips down easy and changes direction with minimal effort. Lowering the bike has dropped the center of gravity, and BMW insists that while the ground clearance is reduced, the RT’s lean angle remains the same thanks to its narrower frame. During our ride we didn’t touch down the pegs or scrape any hard parts, and the RT was game for aggressive riding on the more challenging canyon stretches. The dual-disc radial-mount Brembo stoppers and steel-braided lines up front do a fine job slowing the RT down. They offer up a pleasing initial bite that is strong without being grabby, and a handful of front brake doesn’t cause the Telelever front to dive down dramatically. The braking package is indicative of the RT as whole – refined yet powerful enough to deliver on its sporty pretenses. Riders are greeted to some pulsing levers and pedals when the always-on ABS engages, but I found the system far from intrusive. First and foremost the RT is a touring bike, and rider comfort, as previously already mentioned, is a highlight. Protection from the broad fairing and adjustable windscreen deserve the most credit here. Combined with the strategically placed wind deflectors the RT bodywork creates a virtually turbulence-free riding pocket. I am particularly critical of helmet buffeting from windscreens, and the RT excels in this regard. The screen channels most air around the rider but subtle vents at the base ensure a steadying airflow still cools the rider and helps eliminate backpressure turbulence. There’s no eye-blearing buffeting to be had, and with the adjustable screen riders can dial in their optimal setting. I found the riding position more than amenable to long-distance journeys. The placement of the one-piece cast handlebar proved ideal for my reach. My legs weren’t cramped by the footpeg placement and my knees nestled snugly under the tank. The new seat is 0.8 inches longer (the passenger perch 0.4 inches longer as well) with the foam padding changed for improved comfort. After 200 miles our derriere lodged no complaint. Searching for the menu settings for the heated grips and seat… As the day wore on and the temperature dropped to freezing, we actually turned down the heat with the RT’s cockpit so cozy and well protected from the elements. The RT’s instrument console is highlighted by the crisp, backlit TFT display. The Beemer also offers integrated GPS. BMW’s multi-controller on the left switchgear offers intuitive navigation and operation of the RT’s various menu settings. My test bike featured the heated seat option, which offers five settings. Our riding group had been warned not to turn the seat all the way up to Level 5, as a technical glitch in the RT software might not turn off the thermostat. It’s a technical issue that will be fixed in time for consumers by a simple software download by dealers, but hadn’t been updated in our press bikes. That said, I never went above Level 3, and never felt inclined to as the perch was plenty warm. Same goes for the heated grips, which I turned down to the second setting, even with vented gloves and snow falling around me. The broad fairing and adjustable windscreen deliver ample protection from the elements, with the strategically placed wind deflectors all but eliminating turbulence inside the rider cockpit. The new water-cooled Boxer Twin is more compact, efficient and powerful. Riders manipulate the heated accessories’ settings, as well as the other RT electronic aids, via BMW’s intuitive instrumentation. Menu options are cycled by pressing the left switchgear button, with the sub-menus scrolled and selected by the multi-controller. The rotating multi-controller also commands the optional GPS, which is integrated above the dash as well as the sound system (more on this in a second). But first praise must be lavished on the instrument cluster’s crisp TFT display. The backlit color screen, a prime fit-and-finish feature that is both luxurious and easy to read, displays a host of info on tap including an inset gear position indicator, engine temperature and fuel gauge. The attention-grabbing TFT is flanked by an analog speedo and tach. The GPS navigator, added for a premium $800 asking price, is more difficult to read and a distraction at times – but its integration in the RT’s dash is welcomed for those who must resort to precarious aftermarket solutions to get their GPS mounted. View of the RT’s cockpit from behind the controls. BMW’s Telelever front end on the R1200RT makes use of optional Dynamic ESA semi-active suspension. The RT sports a fully integrated sound system, like its K1600 sibling. A new bass woofer enhances the tones of the onboard radio, Sirius radio (with a one-year subscription included in the RT purchase) and also accommodates iPods and other Bluetooth enabled devices. We tested out the radio during our press ride and the Beemer sound system works just fine – if that’s your thing. Like rest of the production Boxer R series, the R1200RT is shaft driven. Style-wise BMW always has to tread a fine line when updating its bike models, restyling without upsetting the faithful too much. And I’d reckon the RT is one of the most, if not the most, pipes-and-slippers-y clan within the BMW tribe. I’m partial to the lines on the older RT’s front end, but the new bike ain’t ugly – with the reddish tint of the Ebony Metallic colorway particularly fetching. As always, we’ll leave the reader to draw their own conclusions in the looks department. As far as storage goes, the integrated luggage is roomy, lockable and easy to open without the key when unlocked. The optional top-case adds another 13 gallons (49 liters) of luggage space, and again was intuitive to operate, with one-step latch opening. The rear view mirrors aren’t dominated by the saddlebag placement, and deliver a decent view of the road behind. For the BMW riders who don’t give two cents about pricing, feel free to glaze over this paragraph, because costs gets confusing. BMW touts the new RT’s MSRP, which has climbed minimally compared with its predecessor. At $17,650 the base model is $300 higher than the previous model, but includes more in the base package – including steering damper, heated grips, ASC, onboard computer Pro, multi-controller, LED turn signals and two Ride Modes (Rain and Road). At $18,250 the Standard Package RT, which adds cruise control, accessory socket and GPS preparation (though not the GPS unit itself), is actually $100 less than last year’s spec but BMW claims adds $1055 worth of added value. Meanwhile the $20,850 Premium Package pricing is identical to the 2013 model, but adds $1100 of value in options. The Premium package includes all the Base and Standard settings plus Dynamic ESA, heated seats, Ride Modes Pro (adds Dynamic to the base package Rain/Road settings), Hill Start Control, plus the audio system, Tire Pressure Monitors and option for the accessory chrome exhaust. The new Boxer engine delivers 15 more horsepower and unkinks the previous Twin’s peaky mid-range. Mind boggled yet by the price/package options? Well, there’s more, as riders can mix and max various special package options (Comfort, Touring Dynamic, Technology and Luxury) to add to the base model. There’s also a $21,700 Fully-Loaded RT package, which we tested, which includes all the Premium stuff, plus Central locking ($400), Gear Shift Assist Pro ($475) and Anti-theft alarm ($395). Our test bike also had the $800 GPS too, as well as the optional top case (price to be determined). Oh, and don’t forget BMW’s standard destination and handling charge of $495. So $23 grand to purchase the bike we tested… Holy smokes, Bring Money With! While the RT’s costs compare favorably with its predecessor, its rivals on the sales floor are a different story. The Triumph Trophy SE retails for $18,999, with the Yamaha FJR1300ES $16,890 and Kawasaki Concours 14 ABS $16,199. Those three competitors also jack up MSRP with optional extras and destination charges too, particularly the Triumph, but the Beemer still commands a premium. Our day aboard the RT left us yearning for more miles, thanks to its supreme comfort, and MotoUSA eagerly awaits a comparison test with its aforementioned proposed rivals. The new Boxer engine updates the RT package with a sportier disposition, which its revitalized chassis is happy to accommodate. 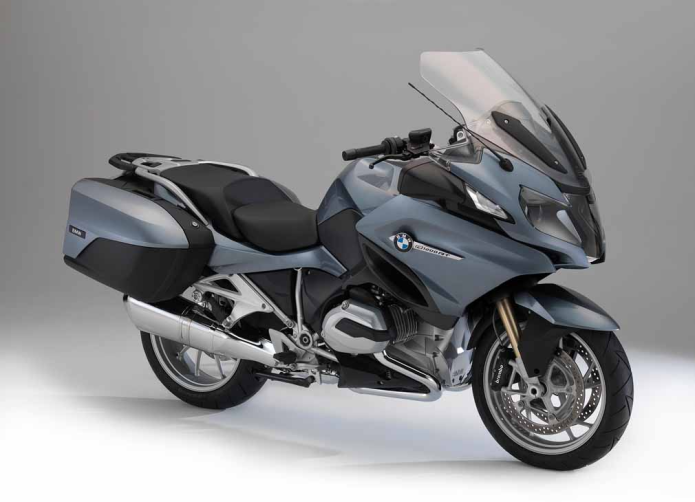 But this is not a rocket ship touring bike like the Concours 14, and Beemer riders so inclined are better served by the K1600GT. Instead the RT offers a more subdued and refined riding experience. It’s a thoroughly competent sport-touring platform with luxury features, and the old guard BMW riders should be quite pleased with this new RT.